The status of Fenestraria aurantiaca is under review to determine whether its proper status is that of a full species or a subspecies of Fenestraria rhopalophylla. Fenestraria rhopalophylla is an evergreen, perennial succulent, up to 6 inches (15 cm) tall. Not present or very reduced stem. The tip of each leaf is transparent, and diffuse the light to the rest of the leaf. The roots are thick, shallow, and spreading. The leaves are glaucous green, smooth, up to 1.5 inches (4 cm) long and with a convex apex. Medium-large up to 1.2 inch (3 cm) in diametar, rich golden yellow, solitary or in groups of up to three flowers borne on long pedicels. 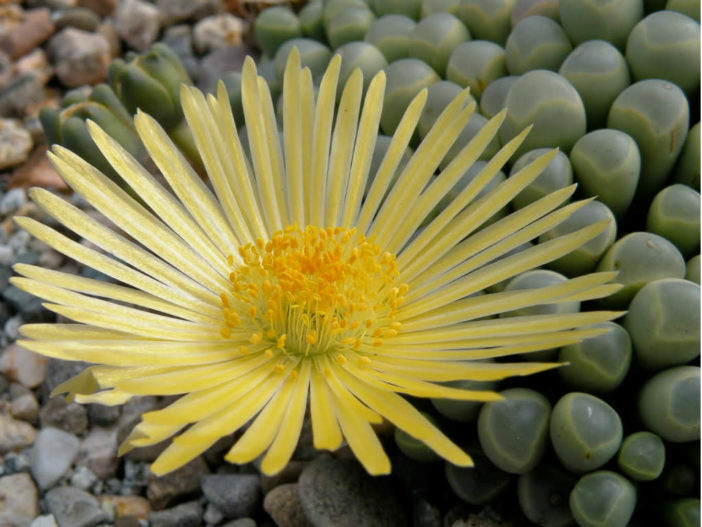 Fenestraria prefer sandy soil and should be watered sparingly at all times to avoid root rot and split leaves. They need to be kept somewhat dry in the summer. Mix equals parts potting soil with pumice or perlite. Outdoors, grow in full to part sun; indoors, provide bright indirect light. Water thoroughly when soil is dry to the touch. Fenestrarias are somewhat frost tolerant, but protection is advisable to prevent scarring. They are usually propagated by seed but sometimes by cuttings. Like many succulents, Fenestrarias produces offsets as the clusters of leaves mature and spread. These are easy to divide from the main clump and will readily produce another plant. The seeds from the plant germinate sporadically and grow extremely slowly… – See more at: How to Grow and Care for Fenestraria. Native to Namibia and South Africa (Northern Cape).